For you don’t want me anymore. 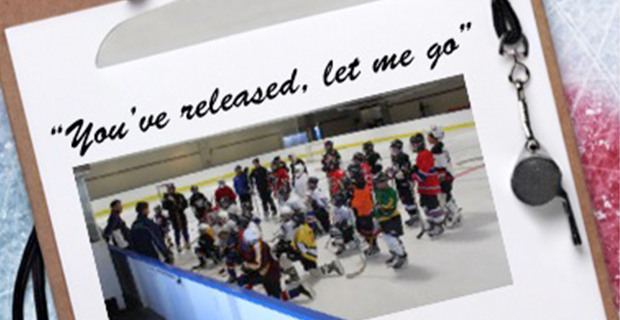 The next two verses would detail how much the youngster wanted to be on the team; that he’d tried so hard; that he did his best; that his friends are there; that he went to an extra two weeks of hockey school to get ready; and that he wishes he could start the tryout all over again. The clincher would come at the end, like the big reveal at the end of a murder mystery. The kid would wonder why he had to ask his Dad to check his email around midnight because the coach was sending everyone the next night’s lineup and the list of who’d been cut. He couldn’t sleep, the boy would moan. At home after the inter squad game, he tried to do homework, but couldn’t concentrate. He snapped at his parents. He even ignored the dog, which only wanted a back rub. Email – The modern day cowardly equivalent to posting a list on the wall and ducking out of sight while kids gather to see if their names are – or aren’t – on it. Why organizations insist on the most impersonal approach possible continues to baffle me. In all my years of coaching at any level, I’ve always done releases face to face. They’re uniformly difficult. I’ve seen young men in tears, parents furious, and released kids slam doors. But in every case, the player was offered a moment with me to learn exactly why it happened. Yes, sometimes there were lineups outside the door that had the ones at the end waiting a half hour. But how is that worse than waiting for an email? At least it was immediate and personal. Not everyone would agree with the choices, but no one could argue they weren’t given valid reasons and an opportunity to discuss it. The most recent instance of the email opt-out was a team coached by a friend who was told by his association that the first releases would be via email. However, only 25 were trying out for the team. His first cuts numbered just four. He wanted to meet with each boy but wasn’t permitted to do so. That night, after the inter-squad game, he sent the emails. Whether or not releases are obvious is a moot point as is how it’s presented. Every kid deserves a chance to hear it from the coach. There’s no great way to release or give bad news. But there are most definitely lots of horrible ways, the effects of which can linger for years. We can do better.